to perform any transaction, simply dial *901# on your mobile phone. It is designed to work with any network and mobile phone. You’ve been registered on the platform now. To buy airtime dial*966*amount*mobile number#, to transfer funds dial*966*amount*mobile number#, to pay bills dial *966*7*amount*SMARTCARD NUMBER#. To check your account balance dial *966*00#. The UBA mobile banking offers ease to various transactions such as money transfer, bill payments, airtime recharge, etc. To get started simply dial*770# on your phone and follow the subsequent commands. To transfer money from Fidelity bank to another bank account, dial *770*Account number*Amount# e.g. *770*3016125703*10000#, you will need the last 4 digits of your ATM card to validate the transaction. You can only make a maximum transfer of N10,000 at once. The maximum you can also transfer daily is N20,000. To recharge your airtime dial “*770*amount# (this is accessible using all types of mobile devices). E.g. *770*200#. To recharge for family and friends, dial *770*Phone no*Amount#. e.g. *770*08023456789*1000#. Daily Limit is ₦5,000 Naira. 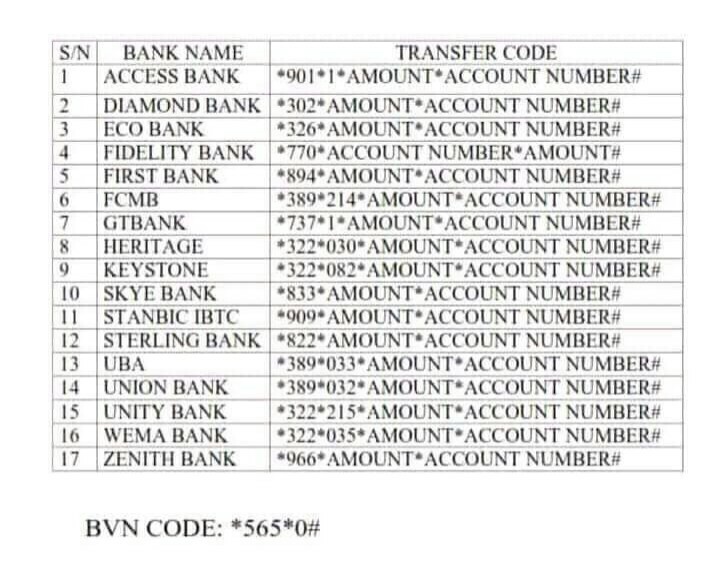 To transfer money to another GTB account simply dial *737*1*Amount*NUBAN Account No# e.g. *737*1*1000*1234567890# from the mobile number registered with the Bank. (This is accessible using all types of mobile devices). To make a bank transfer to any bank account, simply dial*945*BENEFICIARYACCOUNTNUMBER*AMOUNT#. To check your account balance, dial*945*0#, to change transfer *945*00#. Just dial *326# to get started and follow the subsequent commands. You can perform various transactions such as bill payments, airtime recharge and money transfer with Ecobank’s mobile money. 4; dial *894# and select 5 to buy airtime. Finally to manage your account dial *894# and select 7. With Stanbic IBTC USSD mobile money transfer code, various transactions such as salary payments, airtime recharge, one-on-one money transfers, goods and bills payments can be done. To transfer money to any bank, simply dial *710*777*ACCOUNT NO*AMOUNT*PIN#. To check you bank account balance, dial *710*556*PIN#. Account holders are to dial *389*214# from their mobile phone. Three options are displayed on the phone screen alongside a welcome message. Choose option 2 to activate with account number. Afterwards call FCMB Contact Centre on 01-2798800 to generate a PIN for your transactions, this will be sent within minutes. Further dial *389*214# on your phone, navigate to Security then select Change PIN from the on-screen commands. Enter the default PIN issued to by the bank then enter your new 4-digit PIN. Your USSD mobile transfer is now fully activated, for subsequent transactions dial *389*214#. Dial *389*215# to get started with Unity Bank’s Mobile banking on-the-go. Various transactions such as utility payments, airtime recharge, one-on-one money transfers, goods and bills payments can be done.